Asthma is a condition where inflammation of the air passages in the lungs occurs which affects the sensitivity of the nerve endings in the airways and therefore they easily get irritated. The disease is represented by recurrent attacks of breathlessness and wheezing. The causes may be exposed to various irritants that trigger allergies and airborne substances like pollen, dust mites. 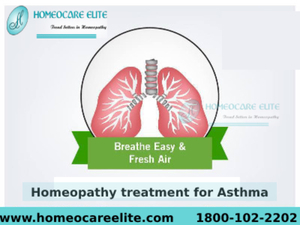 Homeopathy provides compassionate care with great healing power it also gives side effects free asthma treatment which helps to build resistance.